Just over a year ago, Pastor Gollo and Centro Cristiano Cofradia joined a Pastor's Alliance here in the region. 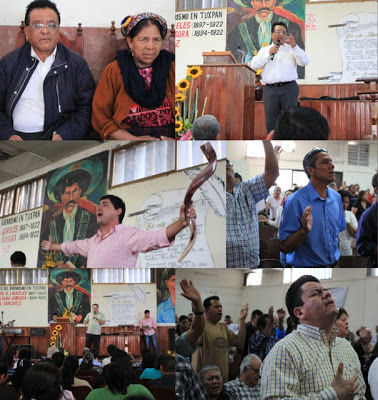 That Pastor's Alliance hosted an Evangelistic Crusade with Mariano Riscajche from Almolona, Guatemala. If you have not heard of what God has done in that city, you need to Google it! 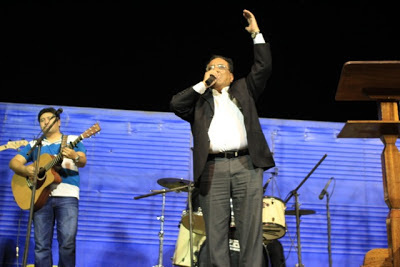 Pastor Riscajche was one of 5 pastors whom God used to bring glory to Himself and literally transform that place. The fruits and vegetables that come out of there are jumbo sized and more than plentiful. They went from one or two truckloads of produce a week to various truckloads a day. It has been mentioned that there are no bars, no police, and no violence at all! Places where there were bars have been turned into church buildings. 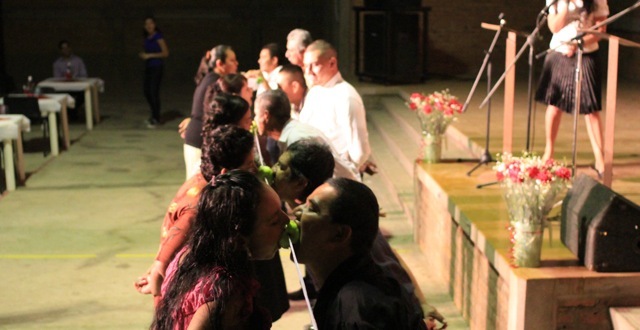 People are being healed and raised from the dead. Pastor Riscajche mentioned that he has been personally involved in 37 resurrections with the latest being this past December 31. He shared of a young man who fell 30 feet as they were preparing for an event. His body was crumpled. After 20 minutes of no response, the doctors pronounced him dead. 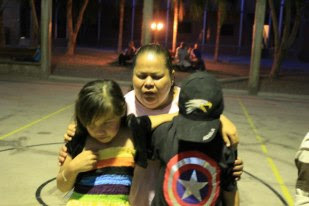 They began to pray for him to return and to the doctors' surprise, the young man started breathing again. After the doctors mentioned it was better for him if he had died because of the injuries, Pastor Riscajche asked for permission to see him. 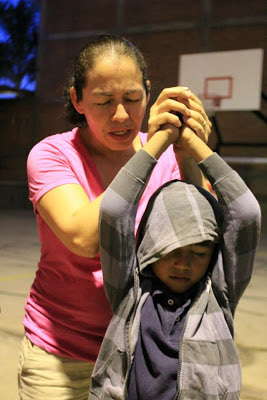 When he got to the room he was in, the young man was wheaping because of the pain and Pastor Riscajche grabbed him, hugged him, and told him to declare, "There's nothing wrong with me!" As the young man struggled getting the words out, he repeated that phrase over and over again. The next day, the young man was walking around as if nothing had happened. Incredible stories that you don't hear every day. Instead, they sound like something you'd read in the New Testament. 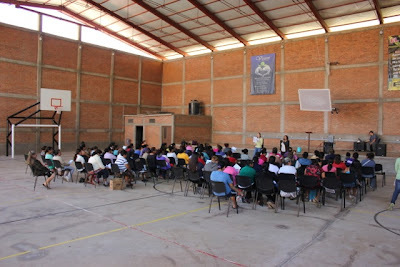 On Friday, February 15th, Pastor Riscajche had a word with Pastors and Leaders. In the evening there was an general service for anyone to come to. 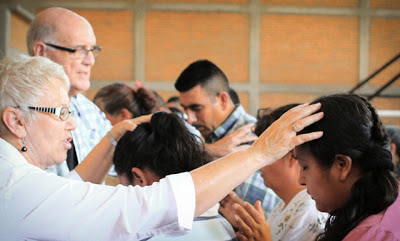 Many people were touched by the Lord, one of which was an elderly lady from Cofradía (Horacio's mother-in-law) who has had pain as she walks for a year. She was healed that night and has not used her cane since. She is telling everyone what God has done for her. It was an amazing and inspiring time. 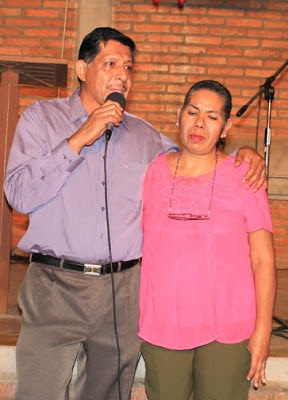 Abraham and Graciela are the Married Couples Leaders for Cofradia Centro Cristiano. 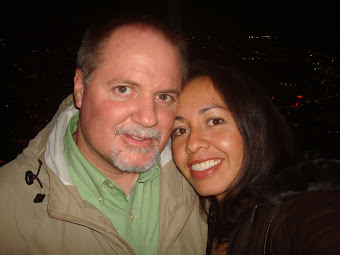 They have been teaching in the evenings of the first Sunday of each month for over a year now and headed up a Married's Date Night held at the church. 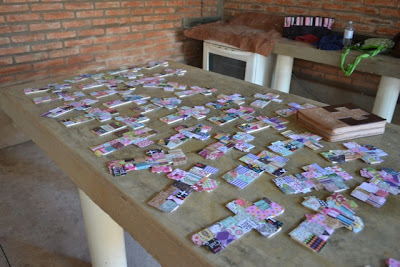 We planned for 45 couples and 48 couples came. 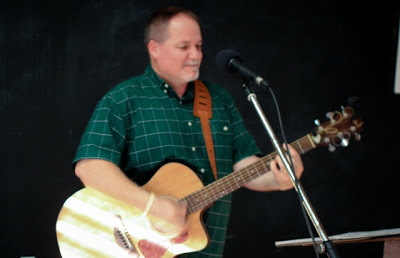 We had a packed house as well as visitors from the Rosamorada Christian Church just north of here. 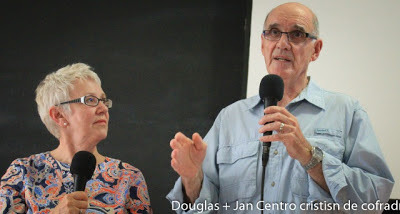 It was an excellent evening with games, testimonies, photos, dinner, and special speakers Doug and Jan Taylor who spoke about having "An Attitude of Gratitude" towards our spouses. 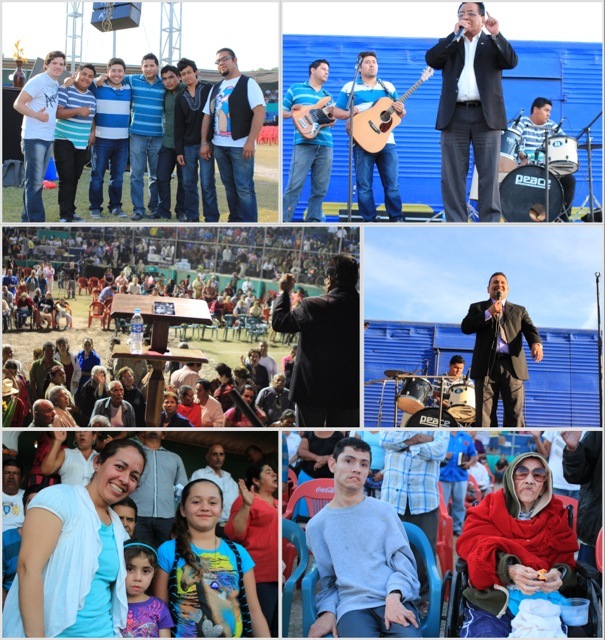 Here are a few pics from the special evening. 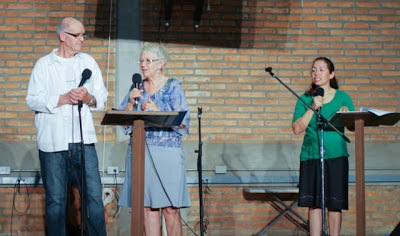 Speakers Doug and Jan Taylor with Steve translating. An apple eating contest. Without using hands, the first couple to finish the apple won a prize. 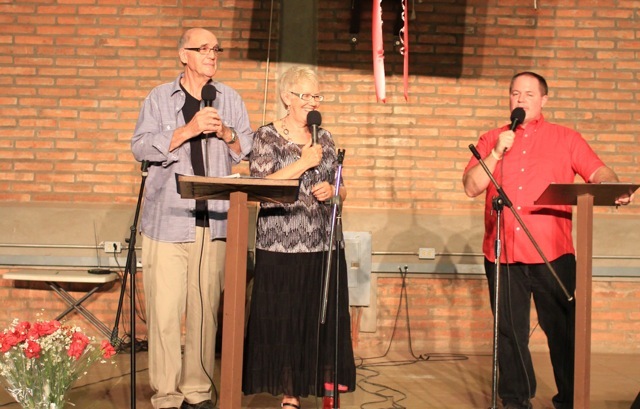 It is always a blessing to have former Cofradia Missionaries, Doug and Jan Taylor, come back to share their lives and ministry with us. Each year, they come to do a variety of different conferences usually focusing on Marriage, Family/Child Rearing, and Leadership. 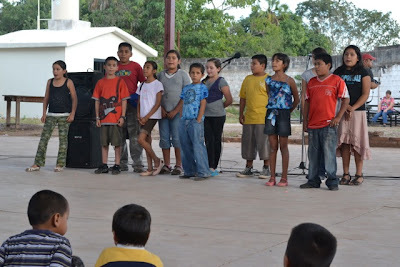 This year we had them come to share about Priorities. The first meeting was with our Leaders on Friday night. As a staff, we believe that having a clear set of priorities will help us be more effective in everything we do, especially if we're ministering and teaching others. They taught our leaders that 1) our relationship with God was first priority, then 2) Family a) Marriage b) Children, then 3) Work; to provide for our family, and finally 4) Ministry. Saturday night was a more general teaching on priorities for the whole church. Sunday morning they shared what our priority as Christians is as far as sharing the gospel--what we do. We are to seek first God's Kingdom and His Righteousness and Sow the Gospel wherever and to whomever. This goes right along with what Pastor Gollo has been speaking on as this year's focus is being evangelistic. He has quoted a number of times St. Francis of Assisi, "Preach the Gospel at all times, and if you need to, use words." Thank you Doug and Jan for taking time out of your busy schedule to spend with us in Cofradia! 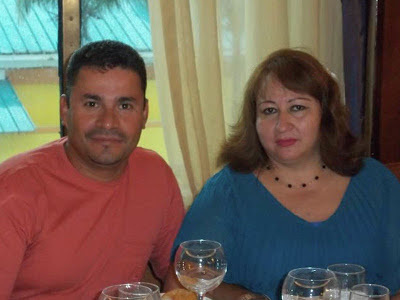 Pastor Heriberto Rodriguez was born and raised in Cofradia and now is an ordained minister living in Florida with his wife, Alba. 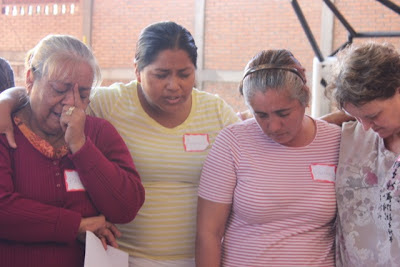 They work together preaching in jails and visiting and praying for people in their homes. Pastor Heriberto and Alba came to visit Cofradia in January for a couple of weeks. 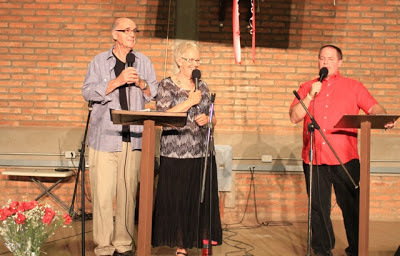 During their time here, they were able to participate in some of the ministries in the Church sharing testimonies and messages in the Men's Ministry, Youth Ministry, and Congregation. 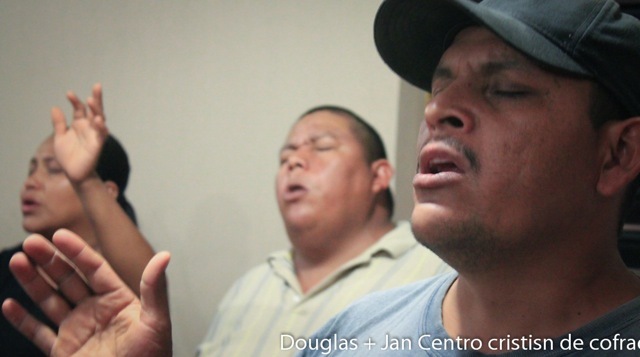 Before meeting Christ five years ago, Heriberto was involved in some pretty rough things that led him to a dead end in his life. Now, free from all of the addictions and habits, he and his wife enjoy a life of ministry together with heavy hearts for children and youth. There are two interesting facts about Heriberto that relate to this mninistry. I met him in the late 1990s, but had very little contact with him. In the year 2000, we started a weekly prayer meeting here on the base. There were consistently about 10-12 people that would come and a few others who, if they had a need, would come as well. We saw miracles happen during that time. One of which had to do with a grandmother asking for prayer for her grandson whom she had not heard from for a long time and she was worried. The next day to her surprise, she received a phone call from him. Heriberto was that grandson. Also, in 2006 we purchased the property where the church located. That property belonged to Heriberto's family. 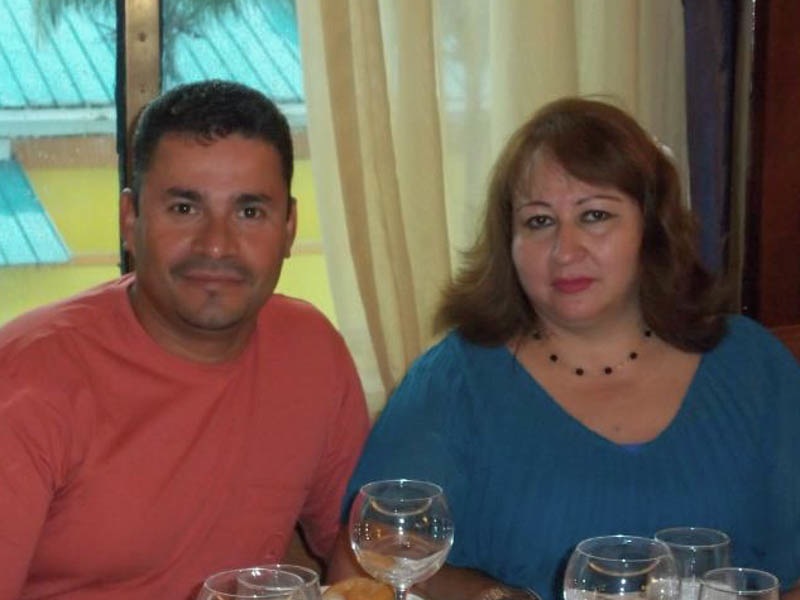 His mother sold it not knowing that Heriberto had plans to build a home on that land some day. Needless to say, when he found out it was sold, he wasn't very happy. Since conversion to Jesus Christ, he is more than excited to know that the property where he once was going to build a home, is now used for the Kingdom of God to which he belongs. His home is built. We were more than delighted with their visit and look forward to working together in the future. This is a very exciting testimony to how God works in the lives of people to whom we minister. God answers prayers, He frees the enslaved, and gives hope to the hopeless. What an exciting reality! Thank you for praying for this ministry! 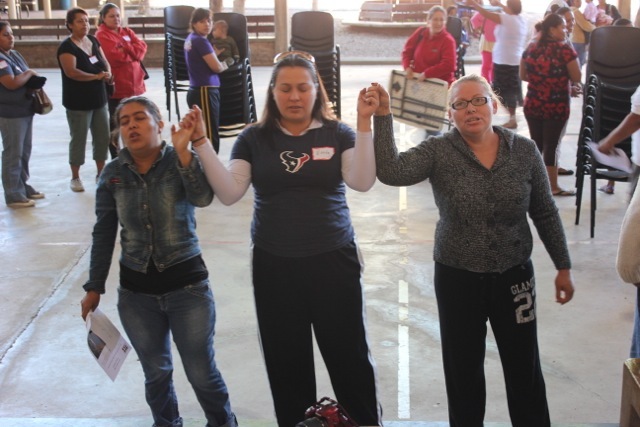 A wonderful success once again as the Women's Team from Cy-Fair, Houston were right on target as they ministered and shared their lives with the women from Cofradia. The relationships that are made and nurtured when they come are relationships that are never forgotten and last for eternity. It's always exciting for me to see the connection that is made with this team. This year, the team participated in two Operation Christmas Child events, spent the week ministering through the book of Jonah, making a craft with the women, and visiting. 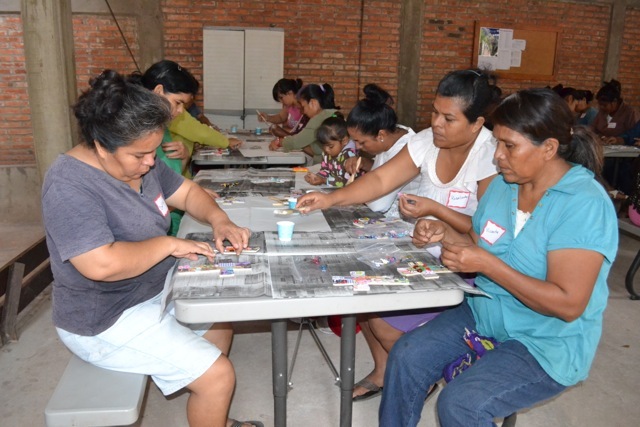 Once the women were done with their craft, they gave it away as a gift to a loved one in order to be able to minister to that person. 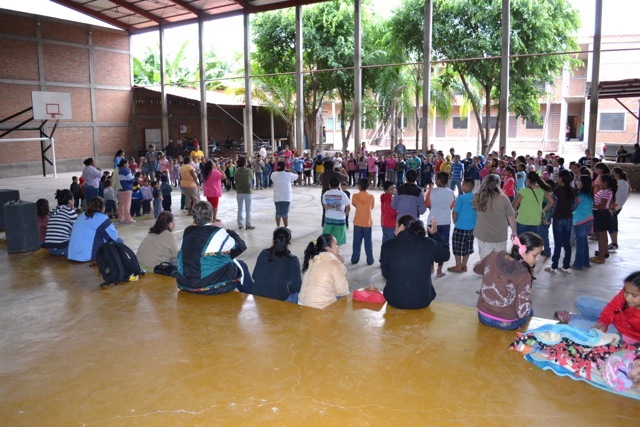 It was the first time for many of the women who came and attended the teachings in the mornings. 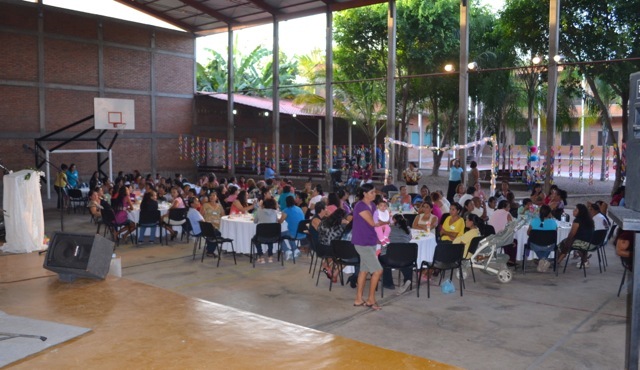 The final evening was the icing on the cake as they served 140 women from Cofradia and the surrounding towns at a banquet held in our auditorium. For a teaching time during the banquet, the Cy-Fair women used and interesting and creative way to speak about the life of Mary Magdalene and Paul as two women were interviewed as those characters. 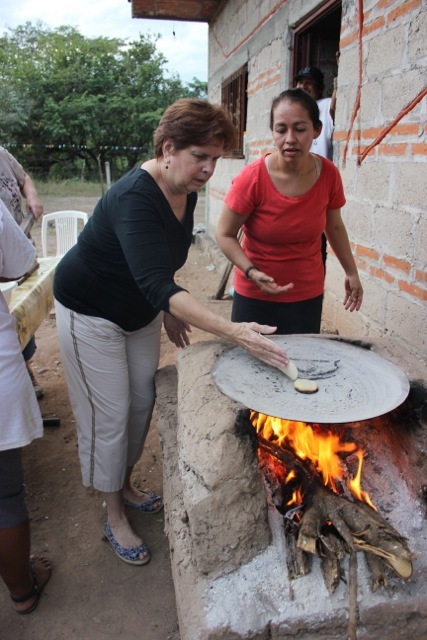 Visiting, learning how to make tortillas. The Banquet with 140 women! If you are interested in bringing a team down, please let us know. 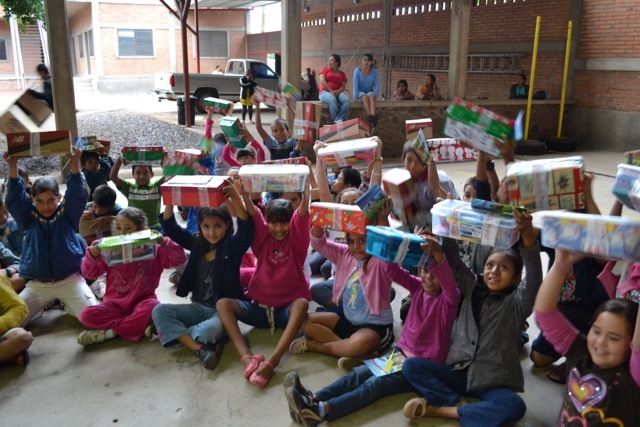 The Operation Christmas Child / Samaritan's Purse Ministry returned to the Cofradia area this year as we handed out 300 Christmas boxes to children in Las Pilas and Cofradía. This year, the children of our Children's Ministry participated in an outreach to the children of Las Pilas as they handed out 100 Christmas boxes. Our Children's Ministry Leader, Antonia Franco, spent a couple of months ahead of time taking a few of our children on Thursdays in "preparation" for this event. 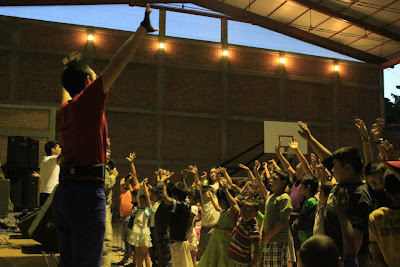 In a sense, our children were being "Missionaries" to another town nearby. They shared bible stories and sang songs each week up until January 6 when the boxes were handed out. Our children did this not knowing they were going to receive a box later. 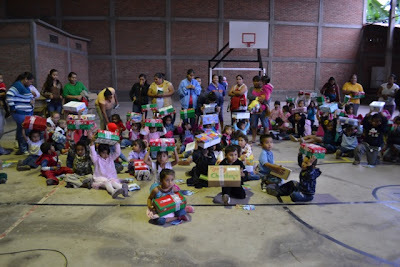 At first for some, it was a little difficult because many of them would not even receive a gift for Christmas, now they would be handing out gifts and not getting one. 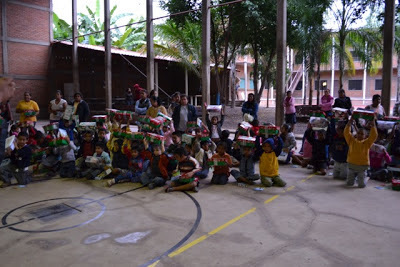 As to their surprise, we were able to purchase 200 more boxes so the children of Cofradía could receive a gift as well. On behalf of the children in Las Pilas, Cofradia, and around the globe that receive Christmas Boxes, THANK YOU to all who participate and give towards this. It really does make a difference. 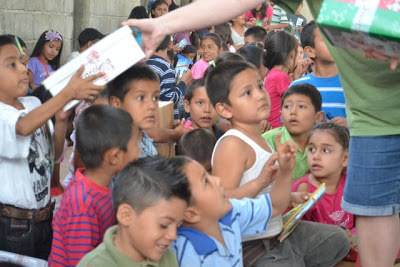 The excitement on the faces of the children is priceless! 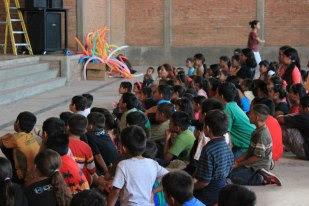 To donate to the Cofradia Children's Ministry, please click on this link and specify it likewise.